My grandma came to this country from central Europe as a young mother in 1920. She raised four children (a fifth child died as an infant) and lived to see those four children have eleven children of their own. I was the last of that latter group, and I didn’t get to know her very well before she passed away, but I certainly felt her love, which was so fierce that it scared me. 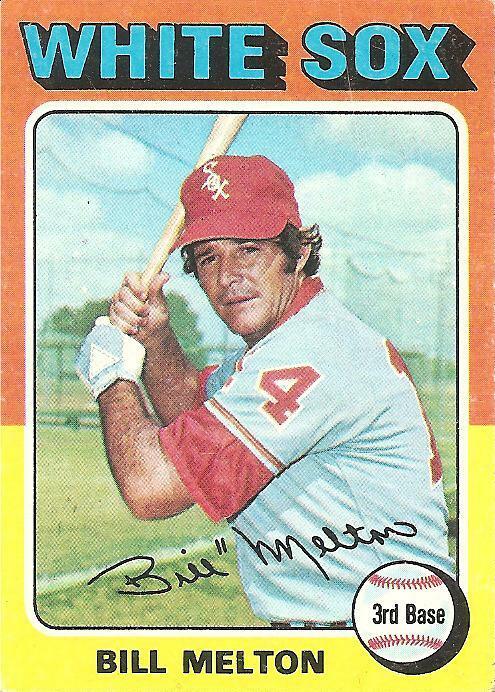 I preferred as a child to relate to inanimate mass-produced Americana, such as this 1975 Bill Melton card, rather than to a stooped old woman with a thick accent who was always trying to get me to eat her frightening Old World food. That fierce love allowed her to shepherd her family along through the First World War and the death of a child and immigration to America and her husband’s early passing and the Great Depression and another world war that pulled all three of her sons into the service and virtually emptied the continent she came from of her people. After that war, her children began raising children of their own. I recently saw a picture of my grandma at the bar mitzvah of one of the first grandchildren, my cousin Lewie, and the pride emanating from her, even through all these years, was palpable. She stood near the center of the picture, her chin upraised, Lewie beside her, flanked also by her three sons: my father, my uncle Joe, and my uncle Dave. Joe lived well into his nineties before passing away a few years ago. In the last two weeks, both my uncle Dave and the bar mitzvah boy, Joe’s son Lewie, passed away, too. Dave’s health had been in decline for a while. He was 87. I hope to find the words to talk some more about him, but I don’t really have them now. Lewie’s death was unexpected. He was 59. Lewie grew up on the South Side of Chicago in the 1950s and 1960s. I only got to know him in the past few years, after moving from the east coast to Chicago. He was a big White Sox fan. He was eight when the White Sox won the pennant in 1959—the perfect age to fall forever in love with a team. He had to wait almost a half a century for his team to get back to the World Series. But the waiting was worth it. He lived to see them win it all. On Sunday, two days after Lewie’s memorial and the same day as Dave’s memorial back east, I went to see Lewie’s team play. The man who holds the team record for career home runs that Bill Melton held for many years, Frank Thomas, was getting his number retired. Thomas cried when he was given the microphone to speak. He seemed to be overwhelmed with gratitude. I found myself thinking about Lou Gehrig’s famous speech from many years ago, when he uttered perhaps the most famous expression of that feeling we all have at least once in a while, when we are seeing clearly: we’re lucky to be alive. I learned two days earlier that Lewie had had some serious health problems a few years ago, and when he got through them he was so grateful to be alive and healthy that he began devoting his life to volunteer service. He eventually became the President of the Board of Directors of the Service League at Lutheran General Hospital. The memorial service for him was packed with people who felt lucky to have known him. You are currently browsing the archives for the Bill Melton category.